VATICAN CITY (CNS) — At 55, Cardinal Luis Tagle of Manila, Philippines, is one of the youngest and newest members of the College of Cardinals, but he is also one of the cardinals most frequently mentioned as a possible pope. His youthful energy, his pastoral experience, his theological training and his communications skills impressed cardinals and bishops from around the world even before Pope Benedict XVI inducted him into the College of Cardinals last November. In 1997, Blessed John Paul II named him a member of the International Theological Commission, an advisory body to the Congregation for the Doctrine of the Faith, which was then headed by Cardinal Joseph Ratzinger, who became Pope Benedict. 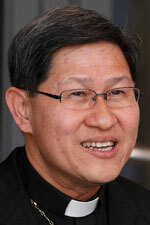 Cardinal Tagle’s speeches at the 2005, 2008 and 2012 synods of bishops drew attention, as did his presentation in February 2012 at a Vatican-sponsored conference on handling the clerical sexual abuse crisis, particularly in countries and regions where very few accusations have become public. At the conference, he said the church in Asia cannot wait for a crisis to erupt before it begins to address the scandal of abuse and put into place measures to ensure that victims come first in the church’s concern. “We do not need to wait for a bomb to explode. Preventing it from exploding is the best response,” he said. The cardinal led discussions about how Asian bishops should prepare their child protection policies, particularly given cultural customs and behaviors that could make it difficult to define inappropriate touching and that work to keep abuse secret. In his speech to the world Synod of Bishops on the new evangelization in October, then-Archbishop Tagle focused on the humility that must mark the church’s interaction with the world, a theme that recurs in his writings and homilies. In his homily during the Mass for his installation as archbishop of Manila in 2011, he promised to remain humble. “I tell myself as though it were the Lord telling me, ‘Chito, do not think you have become great because of your new position. Be great rather in being a beloved and loving disciple of the Lord,'” he said, referring to himself by his nickname. He also told Catholics the church must trust Jesus like the disciples did. In response, he said, the Manila Archdiocese would ” work harder to promote the sanctity of human life and of the human person,” including by educating youth in Catholic values, offering concrete assistance to the poor and working to preserve the true meaning of marriage. In an interview filmed last summer with Canada’s Salt and Light TV, then-Archbishop Tagle was asked if he thought there ever would be a pope from Asia. Born June 21, 1957, in Manila, he studied at San Jose Seminary and Ateneo de Manila University, earning degrees in philosophy and theology. He earned his doctorate in sacred theology from The Catholic University of America, Washington, with a thesis on episcopal collegiality in the doctrine and practice of Pope Paul VI. He was ordained a priest for the Diocese of Imus Feb. 27, 1982, and served in various parishes and as spiritual director of the Imus seminary before becoming rector. He also taught philosophy and theology at the Divine Word Seminary and San Carlos Seminary. In the mid-1990s, he was part of the editorial committee working on a history of the Second Vatican Council for the Institute for Religious Studies in Bologna, Italy. The history has been described in some quarters as being too progressive and as presenting Vatican II as a “rupture” with church tradition rather than a reform in continuity with tradition. Blessed John Paul named him bishop of Imus in 2001. He has served as president of the Philippine bishops’ doctrinal committee and as president of the office for theological questions of the Federation of Asian Bishops’ Conferences. Since 2008, he has appeared on a weekly television program, “The Word Exposed,” in which he offers reflections on the Sunday Mass readings.